This months GPP Street Team Challenge (Green Pepper Press, Michelle Ward) is to experiment with GESSO. This is one of the pieces that I played around with. I use gesso all the time for surface preparation, but it was fun to use it for a bit more. I started with a bit of leftover blue paint on the background of a watercolor journal page. I didn’t have enough to cover the whole page, but that didn’t matter. I then dry brushed some black gesso in both directions, here and there. For the next step, I took a palette knife and applied gesso to a foam stamp and stamped this on the page, giving it a nice texture. When this was thoroughly dried I painted a wash of Golden’s Titan Buff over the whole page and ragged it off. The gesso acted as a resist and let the stamped elements show through nicely. 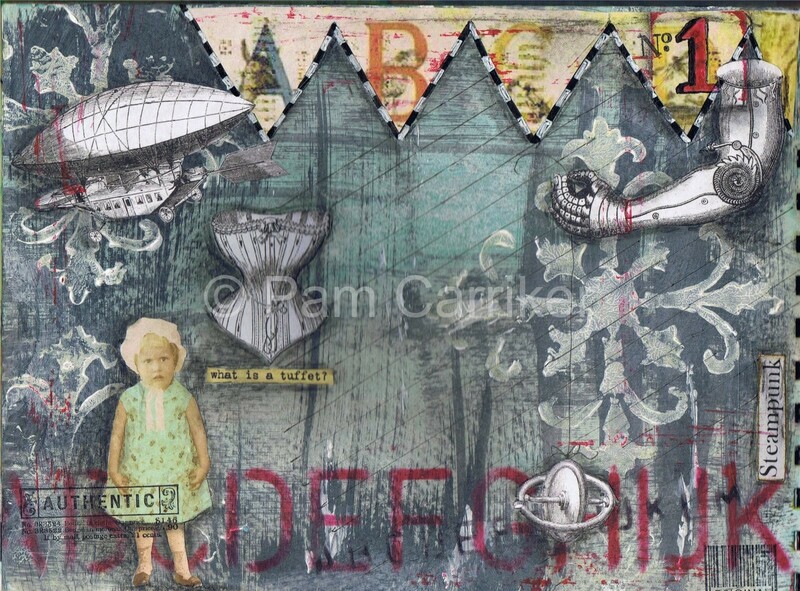 To this background I added collage elements, stamped images, stenciling, and text. The end result is a Pamified Steampunkish look. Yes, I am making up words as I go-lol! I love how you turned this into a collage!!! The design is very eye catching and inspiring! Beautiful, I loved reading about your process AND your made-up words. Thanks! It’s really a gorgeous piece of journal. fab – fab – fab!!! what a great spread! Wow!! I love how your page turned out – really great! I like very much the black gesso too – have to get some of that now! !Your angel and paintings are so beautiful. I love the expressive faces – you are truly gifted! Wow, a finished page and great image! The color works really well, doesn’t it? I love your made up words, too. I mean, in your post! What a gorgeous page! I love all of the details. I have been interested in working with gesso so it was nice to hear about your experience. LOVE it!!! I registered for your class that’s beginning in January, and can’t wait! I have black gesso (so many art supplies that I haven’t tried…must get over that “fear” thing…), and must try this! I love black! g g g g gorgeous gesso pages pam!thanks for the rundown on how you did it and for sharing your work with the team. It came out beautiful, Pam! Thank you so much for your kind comments on my blog.Your piece looks great. I am fascinated by the resist using black gesso. It looks awesome with the blue. Hi Pam! Thank you for your comment on my blog. Wow, I love the spread you did for this crusade. Fabulous! wow, how cool is that !! excellent work….and your new portrait is a beauty too !! WOWZERS I love what you have done for the challenge! It makes a nice resist 🙂 Gorgeous page!